4502 ⊙ 5II 1 ¼ Shilling gray ultramarine, the scarce \"wide wavy ground\", fresh colors and large margins all around with number postmark \"270\". An outstanding quality this Old Germany rarity! Photo expertize \"extremley fine condition\" Jakubek BPP. 4503 ✉ 5II 1 ¼ Shillings, the extremely rare so-called \"far Wave\" fresh colors, three sided excellent to wide margins, at the bottom up to margin line. Top right minimal little tear. A correctly franked extraordinarily scarce single franking on cover with number postmark \"168 (Holstein Railway) \" to Neustadt with on the back transit and arrival postmarks, cleaned, address and envelope a little repaired. The frankings with the far Wave belong to the largest rarities from Schleswig-Holstein. The here offered cover comes from the collection Dr. Carnap / Remscheid, which 1960 in Munich auctioned was. Expertized Friedl / Vienna, Mueller-Mark, photo expertize Walter angel (1964) and photo expertize Möller BPP (2017). Michel 40000,- €. 4504 ⊙ 12 4 Shillings pale ochre-brown, fresh colors with faultless roulette, neat cancelled \"WYK\" in perfect condition. An outstanding quality this Old Germany rarity! Photo expertize \"perfect\" Möller BPP. 4505 ∆ 18e 1 ¼ Shilling dull lilac, 8. Edition, sensational horizontal strip of seven on piece, left stamp small crease, right stamp closed tear, with clean mounted two ring cancel \"NORBURG 17.12.67. \". According to Grobe handbook samples a strip of three and a block of four up to now the largest known multiples hereof. A strip of seven places therefore one the largest valuables of this issue dar. A Honor for the large special collection Schleswig-Holstein! Photo expertize Möller BPP. 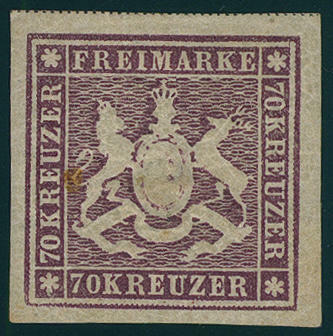 4506 ∆ 7,9,10 1, 6, 9 Kr., all three values fresh colors and normal cut as very decorative three color franking on magnificent letter piece with Nrs \"134\" and additional single circle postmark \"MAINZ 11. May 1859\". 4507 ✉ 45,4 1 / 4 Sgr. Black, colored rouletted, horizontal pair and single, a value inconspicuous paper fragmentation, otherwise in perfect condition with 3 Sgr. 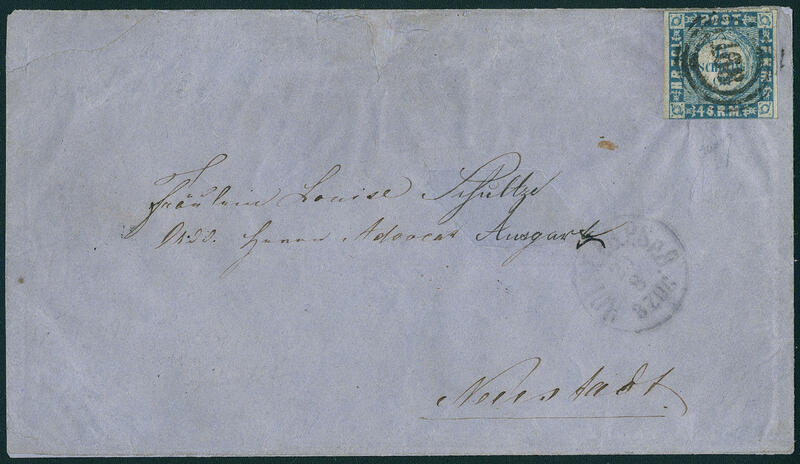 Ochre-brown, colorless rouletted, as horizontal pair in perfect condition on cover with number postmark \"300\" and additional single circle postmark \"Hamburg TH. & T. 22.1. 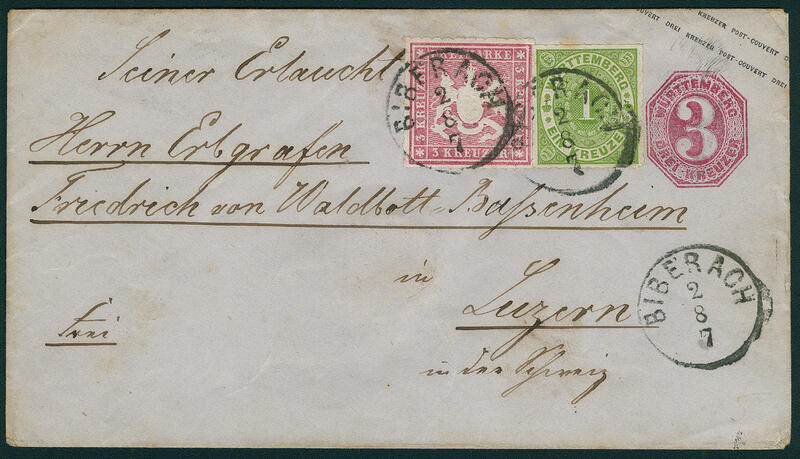 (1867) \" to Genoa / Italy with red \"PD\" and forwarding postage note \"12\" (Kreuzer) with transit and arrival postmarks. A significant franking rarity of this area. 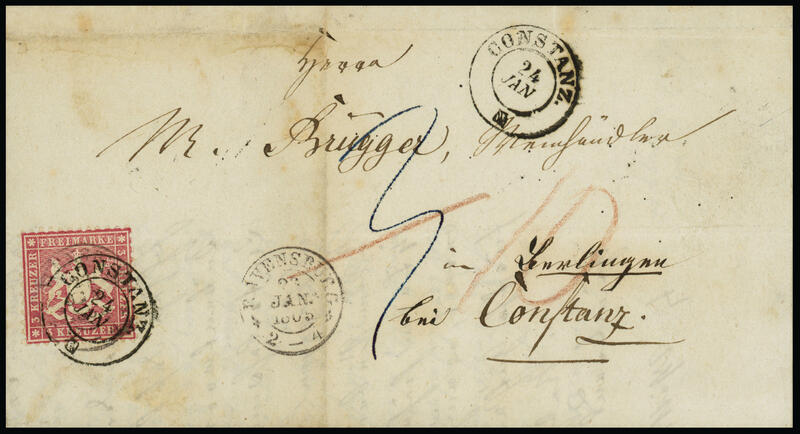 International letters with several copies of the rare ¼ Silver penny with colored roulette to class among the franking rarities from Thurn and Taxis! Photo expertize Sem BPP. 4508 ✉ 50 3 Sgr. 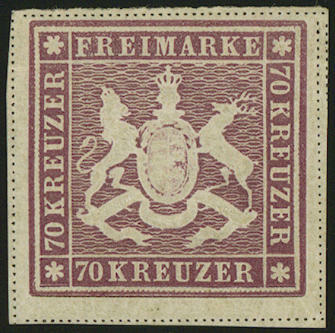 Ochre-brown, colored rouletted, fresh colors and in perfect condition as correctly franked single franking on very nice cover with number postmark \"301\" and additional single circle postmark \"BREMEN 27.6. 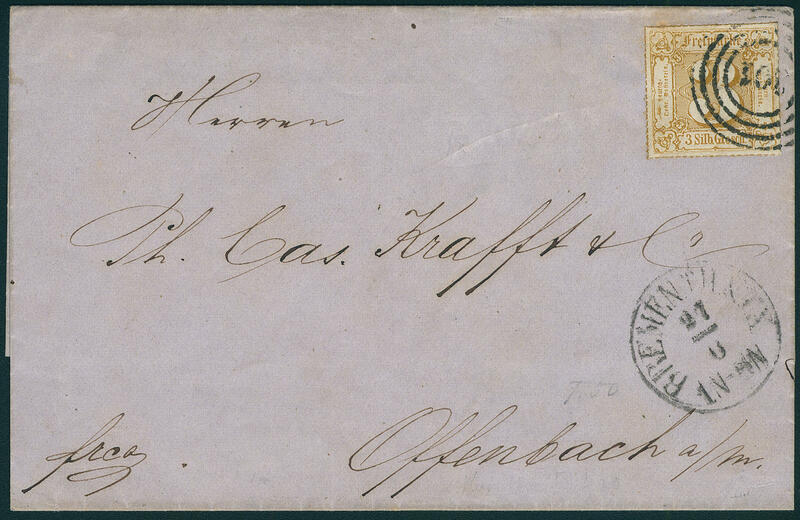 (1867) \" to Offenbach. A very fine example this on cover not frequent issue! Photo expertize \"faultless\" Sem BPP. 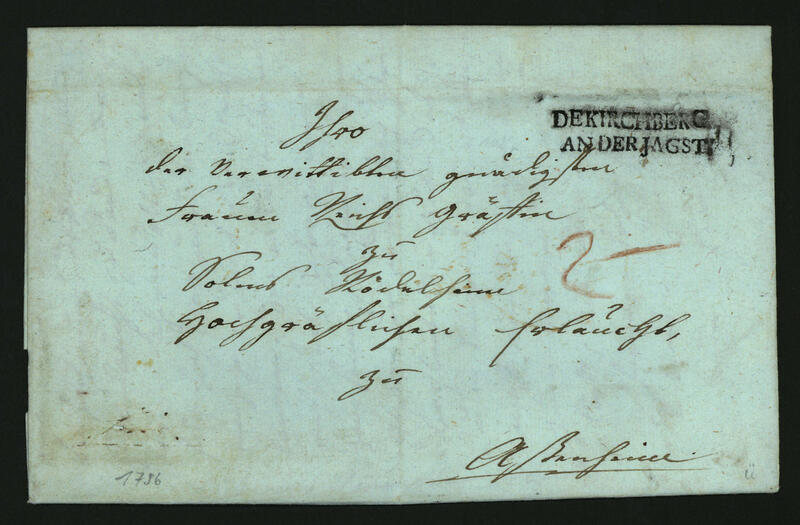 4509 ✉ \"DE KIRCHBERG at the JAGST\" very rare double-line cancel, clear on complete cover from 1786. Pre philately rarity! 4529 ⊙ 16 20 Pfg. 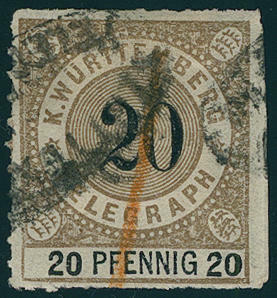 Dark ochre brown / black, stamp size 22:24, 5 mm, having bright colors used superb item of this rare issue. Michel 1000,- €. 4510 ✉ 2yTyV 3 Kr. Black on yellow silk paper, fresh colors, on all sides still having full to wide margins on cover, outside of the franking folded, with adornment three circle cancel \"TUTTLINGEN 5.4.54. \" to Schaffhausen / Switzerland. A rare border rayon postage! Photo expertize Irtenkauf BPP. 4511 15 18 Kr. Dark blue without silk thread, wonderful fresh colors and large margins all around from of the right upper corner of the sheet springing, in perfect condition unused with original gumming. An outstanding quality this Wuerttemberg rarity! Photo expertize Thoma BPP. 4512 ✉ 26a 3 Kr. 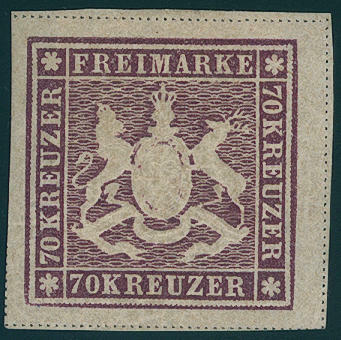 Carmine, wide perforated, fresh colors and well perforated on cover with tenderly two ring cancel \"RAVENSBURG 23. 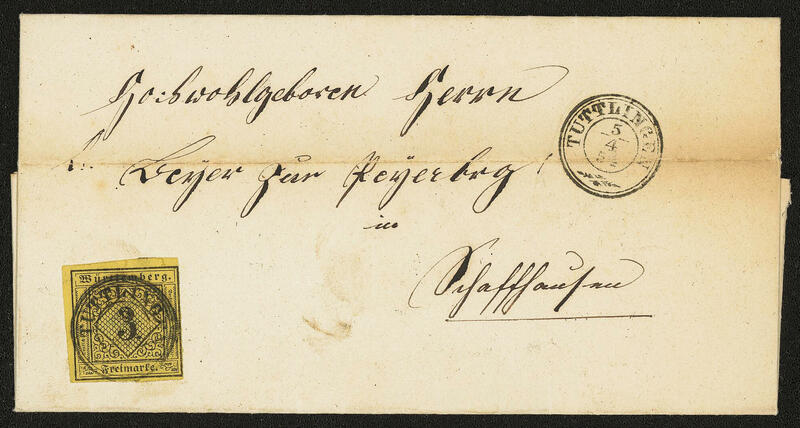 January 1865\" to \"BERLINGEN by CONSTANZ\", which in the Swiss canton Thurgau lies. 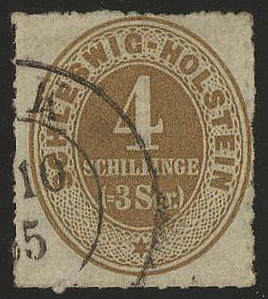 In Constance was the stamp once again tied by two ring cancel \"CONSTANZ 24. January\", whereby the UPU rate acknowledged was and the cover to Switzerland forwarded with blue rate marking 3 (Kreuzer), which from consignee in terms of 10 Rappen charged were. An exceptional interesting and fine cross-border cover! 4513 ✉ 31a,36a,U17 3 Kr. 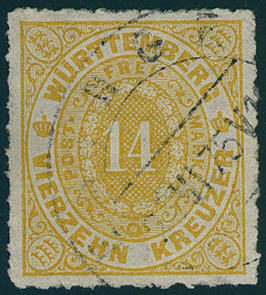 Rose, issue 1865, in mixed franking with 1 Kr. 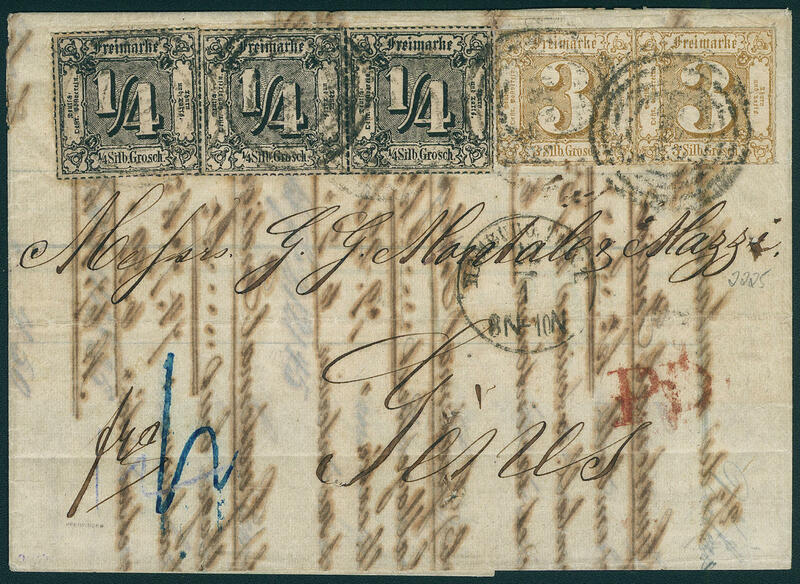 Green, issue 1869, on postal stationery cover 3 Kr. Pale carmine, the 1 Kr. 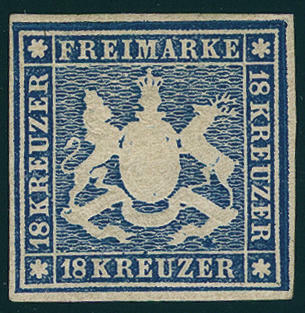 With minimum edge tint, as far as in perfect condition with single circle postmark \"BIBERACH 2.8. (70) \" to Lucerne / Switzerland with transit and arrival postmark. A very scarce representation of the Switzerland postage and especially decorative. Consignee was the hereditary count Friedrich from Waldbott-Bassenheim. Photo expertize Heinrich BPP. 4514 ✉ 35b,36a 7 Kr. 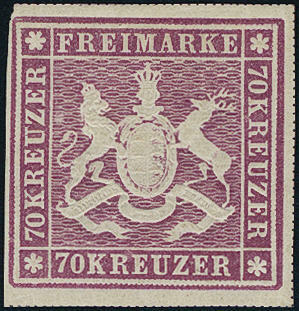 Slate blue, the good colour the coat of arms issue in mixed franking with two copies the 1 Kr. 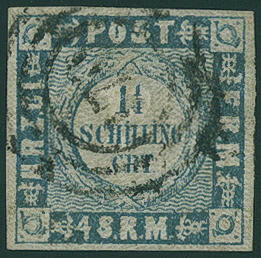 Green, numerals issue, partly small faults, on cover with clear single circle postmark \"STUTTGART 15.7. 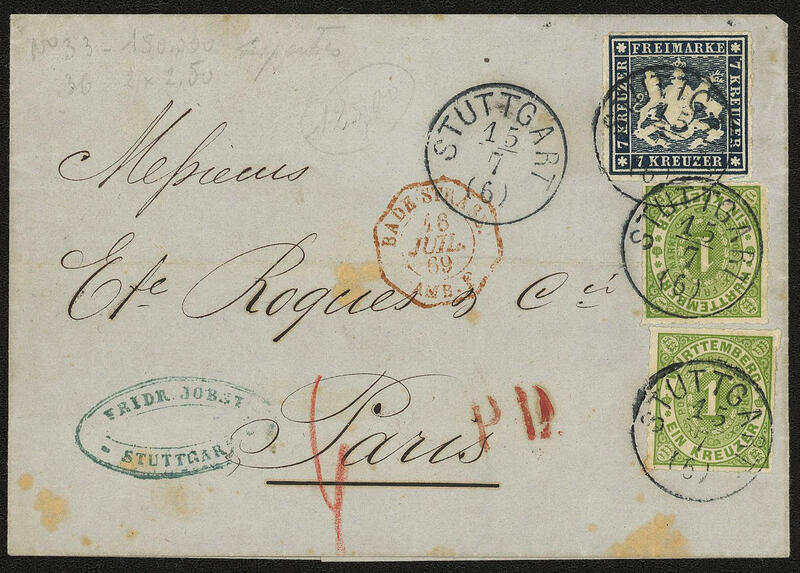 (1869) \", small signs of ageing, to Paris with red border transit postmark and red \"P. D. \". The cover is with 9 Kr. Correctly franked franked. A scarce and sought franking-combination! Photo expertize Heinrich BPP. 4515 ⊙ 41b 14 Kr. Ochre yellow, wonderful fresh colors with perfect roulette, neat cancelled \"EBINGEN 26. VI. 75. \". An outstanding quality of this rare, nearly always missing colour! Photo expertize \"genuine and immaculate\" Irtenkauf BPP. 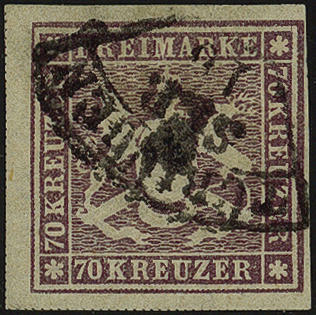 4516 42a 70 Kreuzer brown lilac, wonderful fresh colors, on all sides extremely with wide margins with Security lines at all sides, in perfect condition unused with original gumming. An outstanding quality this Wuerttemberg rarity for the highest standards! Photo expertize Heinrich BPP. 4517 42a 70 Kr. Brown lilac, wonderful fresh colors and on all sides with very wide margins, above with full visible dividing line, unused with original gumming, all insignificant, not disturbing tiny spot behind the left heraldic animal. A beautiful copy of this rare issue! Photo expertize Thoma BPP. Michel 3800,- €. 4518 ⊙ 42a 70 Kr. Brown lilac, wonderful having bright colors outstanding quality with centered fan cancel \"TÜBINGEN\", a pronounced nice copy this Old Germany rarity in perfect condition, photo expertize Thoma BPP. Michel 7000,- €. 4519 42b 70 Kr. Brown purple, wonderful fresh colors, on all sides with very wide margins with cut lines at all sides, very clean unused with original gumming. An outstanding quality this Old Germany rarity for the highest standards! Photo expertize Heinrich BPP. 4520 42b 70 Kr. Brown purple, wonderful fresh colors and good margins, three sided with full visible dividing lines, in perfect condition unused with original gumming. A very nice copy this Wuerttemberg rarity! Photo expertize \"genuine and in perfect condition\" Thoma BPP.